Looking for a basic, classic color for your carpet but something not quite as neutral as beige? Let's talk blues. 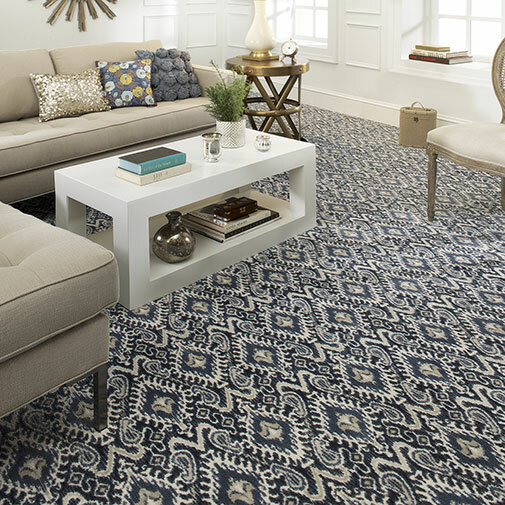 Blues are quickly becoming a top selling carpet color in Indianapolis. Blue carpets can act as an anchoring neutral or a more bold design element. 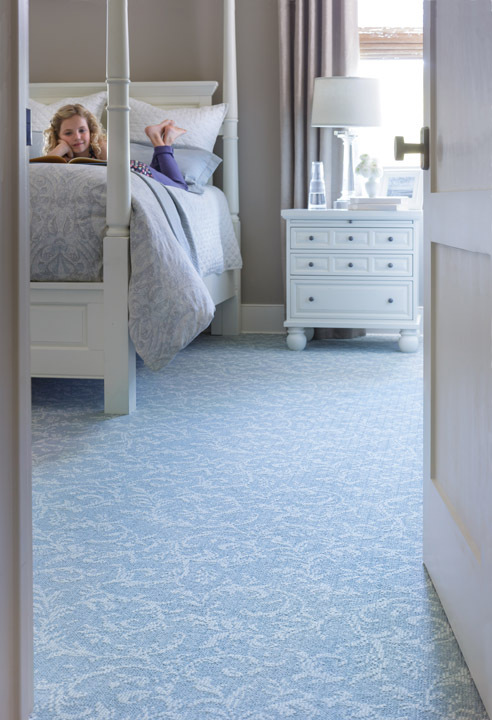 Break out of the beige and brown carpet box and take a look at beautiful blue carpets. Flooring trends may come and go but carpet remains one of the most popular floors for Indianapolis homeowners. Carpet is warm and comfortable. It's a natural insulator - for both temperature and sound. Carpet is also a budget-friendly floor. Today's homes tend to use a mix of flooring. It is not uncommon to walk into a home and see tile, hardwood and carpet all on the same level of the house. The trick is to balance your lifestyle needs and look for floors that complement each other with a common color or shade. No matter where you want to add carpet, you'll find a style that works in your decor. We asked Kermans Flooring store in Indianapolis what color trends they are seeing this year. The answer? Jewel tones. "Soft greens, deep purples and classic blues are becoming popular choices for any room of the house," notes Kermans flooring expert Brad Malia. You might be surprised to see the full range of color you'll find when you look at blue carpets. Soft, greyish blues offer an interesting twist on a neutral carpet. Deep navy blues add a touch of luxury to a dining room or can make a bedroom feel extra cozy. Mid-range blues are gorgeous in patterns or to open up a room's look and feel. Bringing blues into your home adds a cool, calming influence. As a color seen in nature, they also naturally add the feel of open sky or wide blue water. The influence of color in a design is important if subtle and these gorgeous blue carpets are no exception. Area rugs offer another great way to take advantage of the current trend towards blue flooring. You can layer a blue area rug on top of any flooring - carpet, hardwood or tile - to add a layer of color and texture to the room. Did you know that Kermans offers free design assistance to all customers? Stop by our showroom and we'll be happy to help you narrow down the choices to just the right floor for your home, budget and lifestyle.